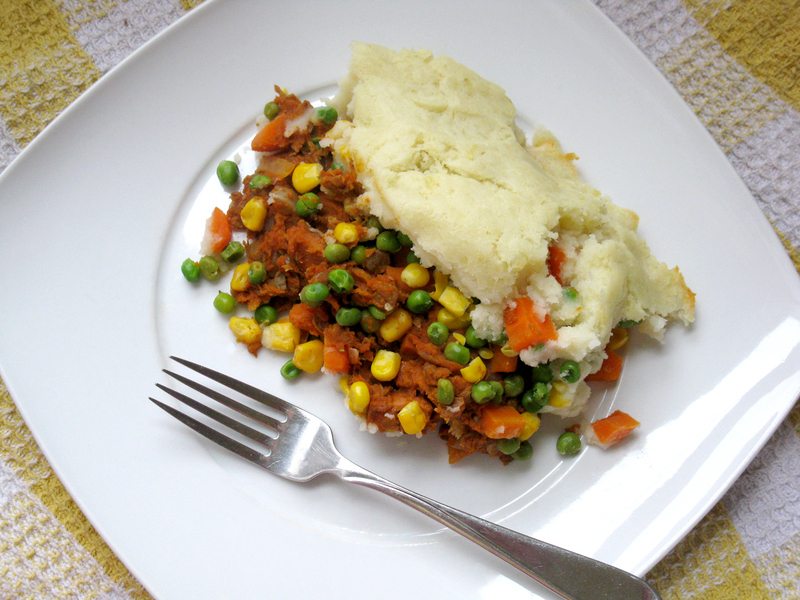 Amazing Vegan Shepherd’s Pie | Live. Learn. Love. Eat. Yesterday morning we woke up to a light bit of snow on the ground. 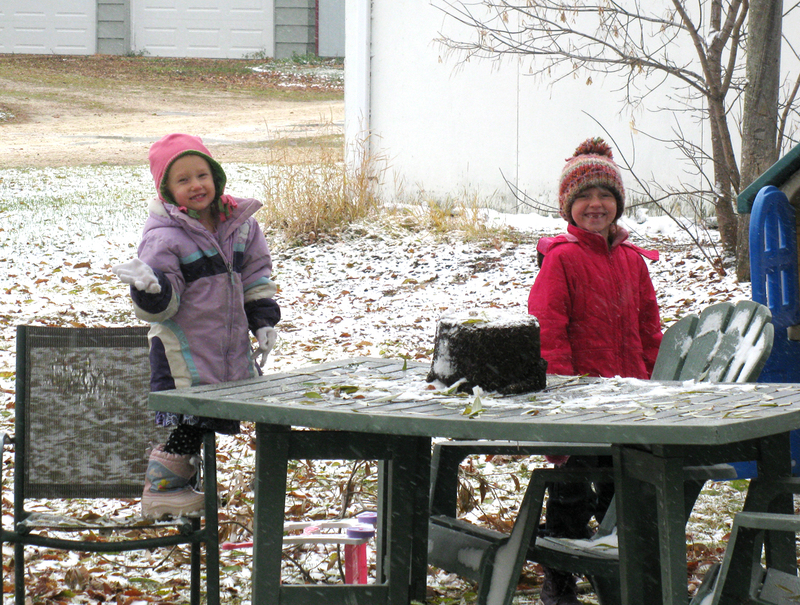 It was the first bit of snow that we’ve had and the girls were so excited about it. After breakfast they eagerly got their winter clothes on and headed out the door to play. Autumn had the awesome idea of making a mud cake with snowflake sprinkles. Of course the snow melted by the afternoon and so did Autumn’s excitement. She asked me if it was going to snow again and I said “yes and then you’ll wish it was summer again.” We took a nice long walk in the evening after another amazing supper, enjoyed some Chocolate Almond Butter Stuffed Cookies for an evening snack and then got our Rocky on. Oh yes we did! This recipe takes a bit of work, but the end result is a hearty family meal with enough leftovers for the next day. The addition of the tofu dogs really adds a meaty flavor and is especially fun for kids. There is something for everyone to appreciate in this dish. Bring the water and lentils to a boil in a medium saucepan, reduce heat to low, cover and simmer 30 minutes, until soft. While the lentils are cooking, bring a large pot of water to boil and cook the potatoes 10-12 minutes, until soft. At the same time, bring a medium saucepan to boil with 4 cups of water. Add the carrots and boil 2-3 minutes. 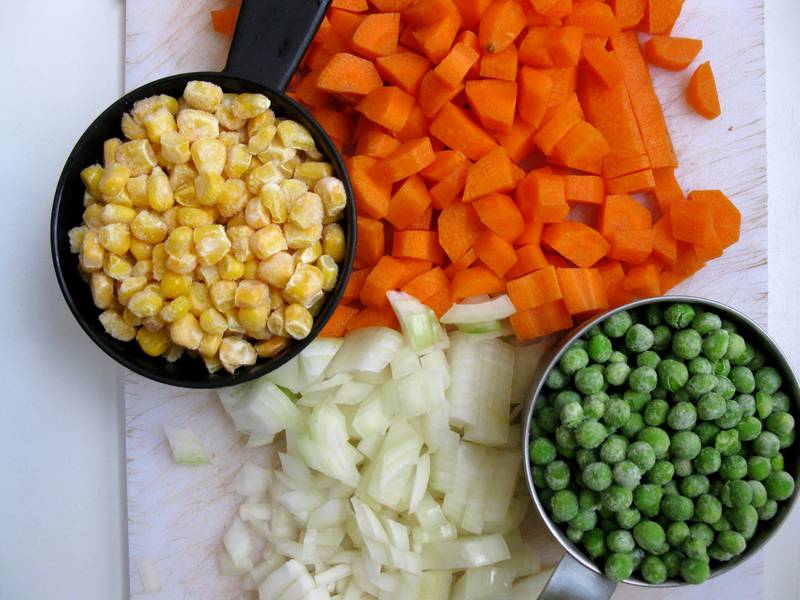 Add the peas and corn and boil a few minutes more until all the vegetables are tender. 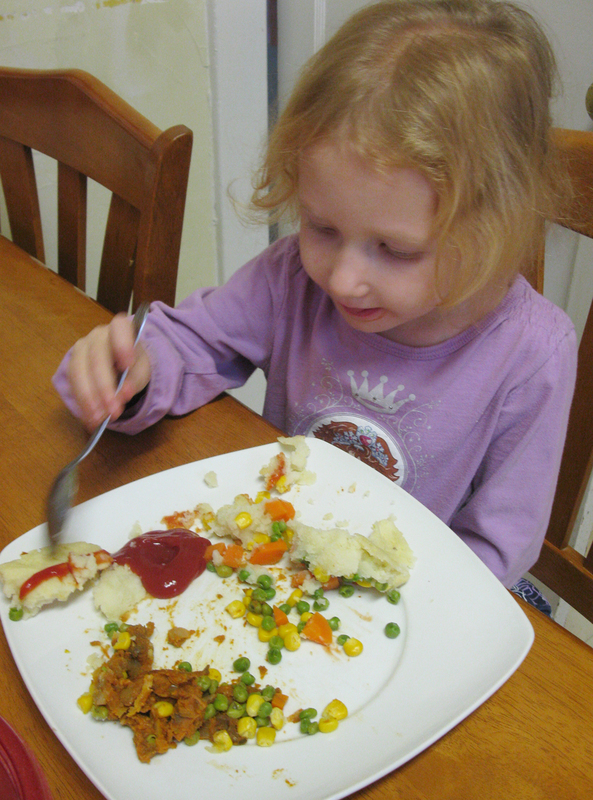 Drain the cooked vegetables and set aside. Drain and mash the potatoes with the margarine and sea salt and set aside. Preheat the oven to 350°F. Once the lentils have finished cooking, heat the sunflower oil in a large skillet on medium heat. Add the onion and garlic and saute for 5-10 minutes, until soft. Next add the tofu dogs and fry a few minutes more until they begin to brown. Add the cooked lentils, along with the tomato paste, nutritional yeast, red wine vinegar, spices, salt and pepper. Cook until mixture is hot. Transfer the ‘meat’ mixture to a 2 1/2 quart casserole dish and spread evenly. 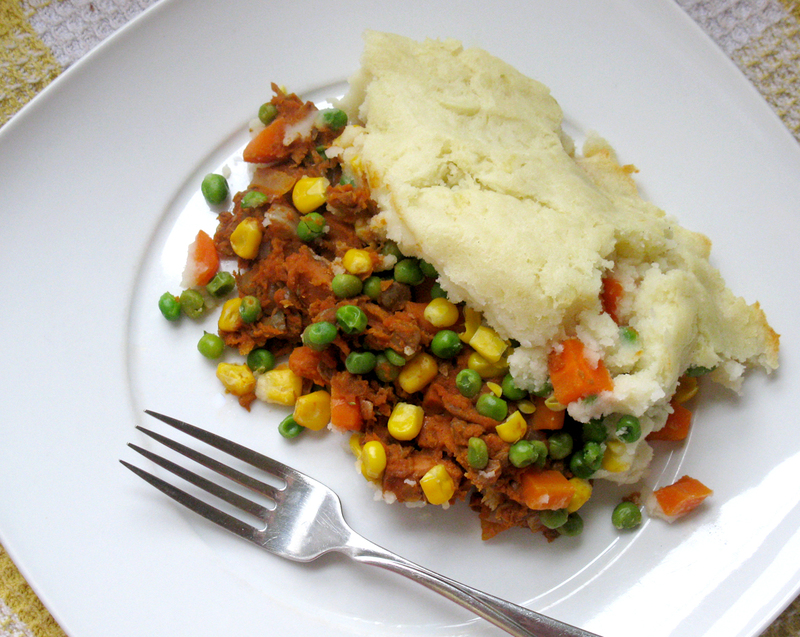 Top with the cooked vegetables. Finally top with the mashed potatoes. Place in the oven to bake 30-35 minutes. I actually learned something about myself today while cooking this meal, I can dice an onion with one hand! So don’t even tell me that this recipe looks too hard to make.